I’m visiting Mom this week – so I thought I’d share some of my favorite cookie recipes with you while we’re away. And this is one of my family’s favorites. I have it on good authority (as in everyone I’ve ever baked these for) that these are the best oatmeal cookies you will ever eat. I will also confess and tell you it’s not my original recipe. There is a gal that cooks for the scrapbook retreats that I used to go to and this is a modification of her grandma’s cookie recipe. I tried them there and absolutely fell in love with them. 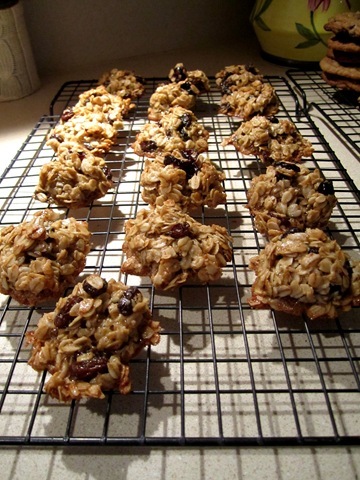 There are no oatmeal cookies to compare. These are a chewy texture cookie. Not crunchy, but not gooey either. Just right. You start the cookies the day before you bake them. I think the overnight soak in the brown sugar and oil is what makes these cookies so chewy and good. I used the blueberry flavored Craisins in the batch I made this year. I thought they were particularly good, although I’ve used raisins and plain Craisins in the past and they were good, too. A couple more tips – you really do have to use the parchment paper that is called for. And you really do need to let them cool thoroughly before you move them off the paper. If you don’t, the cookies will fall apart. Trust me, I’ve tried it and had disastrous results. Ok, here’s the recipe. Do let me know if you try them and what your loved ones think of them. Mix these together in a large bowl or zip top bag. Store in refrigerator overnight. Drop by teaspoonfuls onto parchment paper-covered cookie sheets. They do not spread much so you can fit them relatively closely together. Slide parchment paper off cookie sheet and transfer to cooling racks. Let cookies cool completely before removing from parchment paper. Stores for at least a week (if they last that long!) in a sealed container. Is 8 hours enough in the refrigerator? I mixed the first ingredients this morning, and will make them tonight around 6 or so for Jamie’s birthday tomorrow. Is that long enough for refrigeration? Oh yeah, I would think so. It’s more about chilling the dough down.